Sony knows that gamers take their gaming sessions seriously – after all, they have had their fair share of experience with feedback from PS3 owners. There is no quite better way to play First Person Shooters (FPS) games than using the traditional keyboard and mouse setup, but that is just the beginning. Advances in gaming audio technology has made listening to audio cues extremely important, as that would help you determine the location of your adversary before you fire off that money shot. 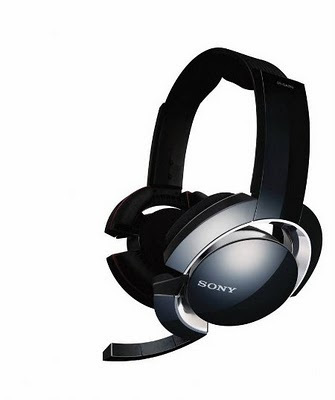 Sony aims to make this a private affair with the DR-GA500 gaming headphones that boast 7.1-channel digital surround sound, accompanied by the DR-GA200 where both of them have 40mm drive units for premium gaming sound quality. Both models will also be equipped with the unique ‘triple enfolding’ design for unrivalled comfort over long periods of wear. First off, the DR-GA500 will merge a Dolby Pro Logic IIx decoder with unique Sony Virtual Phones Technology (VPT) in order to create convincing 7.1-channel 3D surround effects – works great only if the game was programmed to support such a set up natively, otherwise something that is artificially cooked up won’t sound as good. The whole signal processing hardware is contained within a compact external unit, resulting in a soundscape rich in precision spatial detail that pinpoints everything from a stealthy footstep to the position of an exploding grenade. Both the DR-GA500 and GA200 gaming headphones will also be able to keep strategy and online multiplayer gamers happy, especially where both genres require long stretches of gameplay. Thanks to 40mm drive units that deliver outstanding sound quality with resonant, living bass and crisp high frequencies, alongside the aforementioned ‘triple enfolding’ design, you can be sure that comfort is on the top of the list for either model. They will also enhance your gamer looks thanks to a striking and individualistic design. From October 15th onwards, both the DR-GA500 and DR-GA200 will be accompanied by a free copy of the keenly anticipated new Medal Of Honor single player game – now how about that for value?